Watch out — could be headed soon to a McDonald’s near you. Impossible Foods hit the big leagues last summer when David Chang started serving its “bleeding” vegan burger at Momofuku Nishi. The Silicon Valley start-up’s patty rose to fame because it looks, tastes, smells, and even bleeds (thanks to a plant chemical called heme) like the real deal. It’s since debuted at Public, Saxon+Parole, two great San Francisco restaurants, and one in Los Angeles. And, starting today, the Impossible Burger joins meat alternatives like the quinoa-veggie patty on the menu at Bareburger. It’s rolling out at the flagship location on LaGuardia Place near NYU, but the chain says potentially all outlets will offer it once Impossible Foods ramps up production. 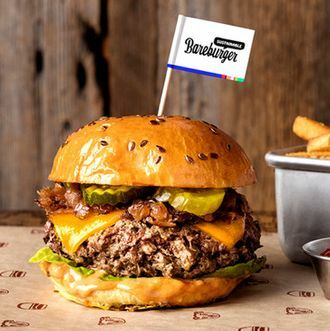 Bareburger has now grown to 43 restaurants in five countries, and it’s the first multiunit chain to feature the burger. Customers can get it as a standard all-American cheeseburger — American cheese, onions, dill pickles, and lettuce on a brioche bun — for $13.95. Or they can also have it DIY, customizing the bun, sauce, and toppings however they’d like. It will “live side-by-side with the beef burger,” Bareburger’s CEO Euripides Pelekanos proudly notes. Pelekanos says he was “totally blown away” when he tried the burger, telling Fortune he couldn’t believe it when they “cooked it and cut it open and bled like a medium-rare burger.” Expect to see a lot more of the Impossible patty, too: The start-up plans to open a new plant in Oakland later this month to expand capacity.